Shrimp and Sausage Gumbo is one of the most traditional recipes of Louisiana, it’s actually a type of stew. Gumbo can be made with or without okra or file powder. I almost always use okra in my gumbo. It not only adds flavor, but it also acts as a thickener to the stew. 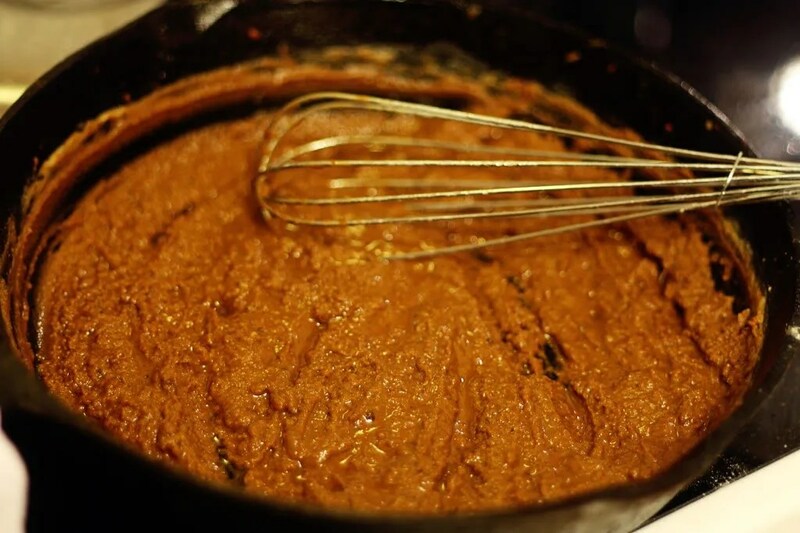 The backbone to great gumbo is the roux. This gumbo uses a deep, rich, copper-colored roux made by slowly browning the flour in oil and sausage drippings. 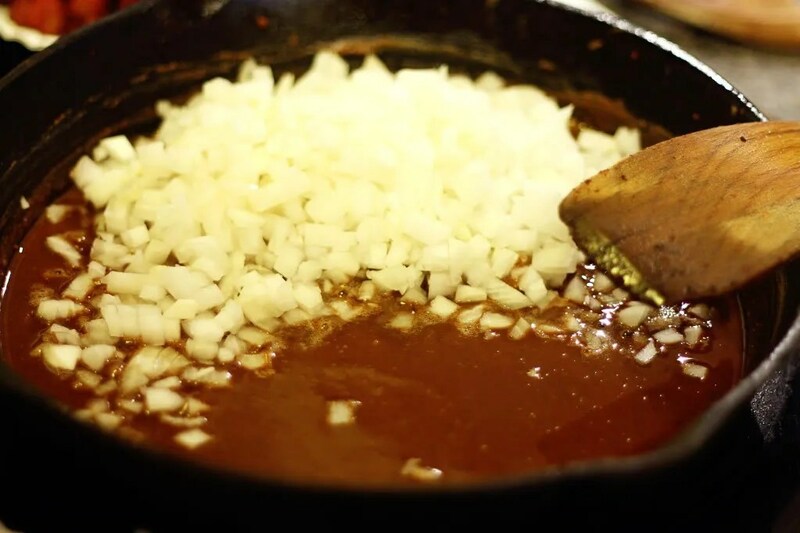 Be sure to take your time with this step because a burned roux will ruin your gumbo. 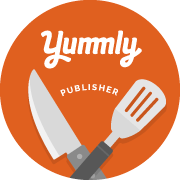 If you enjoy cajun and creole foods, check out my Seafood Gumbo, Grillades & Cheese Grits, Cajun Fried Catfish, Creamy Crawfish Etouffee, Cajun Red Beans and Rice, Crawfish Hand Pies, New Orleans Style Bananas Foster, and Buttermilk Beignets. 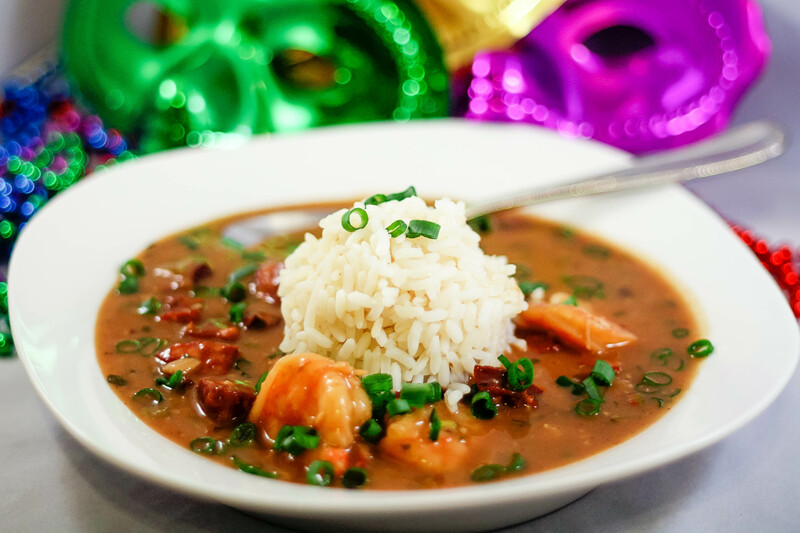 Let’s start off with this fabulous gumbo! Start off by making a great roux. First quarter and dice the Andouille sausage. In a large Dutch oven or heavy iron skillet, lightly brown sausage in 2 tablespoons vegetable oil or bacon grease. When sausage is lightly browned and rendered of fat, remove it to a plate with a slotted spoon and pour drippings in a heat proof measuring cup. Fill the cup to the 3/4 cup mark with additional vegetable oil, if necessary. Return oil mixture back to the pan and heat the oil to almost smoking, over high heat. Add 3/4 cup of all-purpose, flour all at once to the oil, whisking constantly. Lower heat to medium-low and continue whisking until the roux turns chocolate / copper in color. 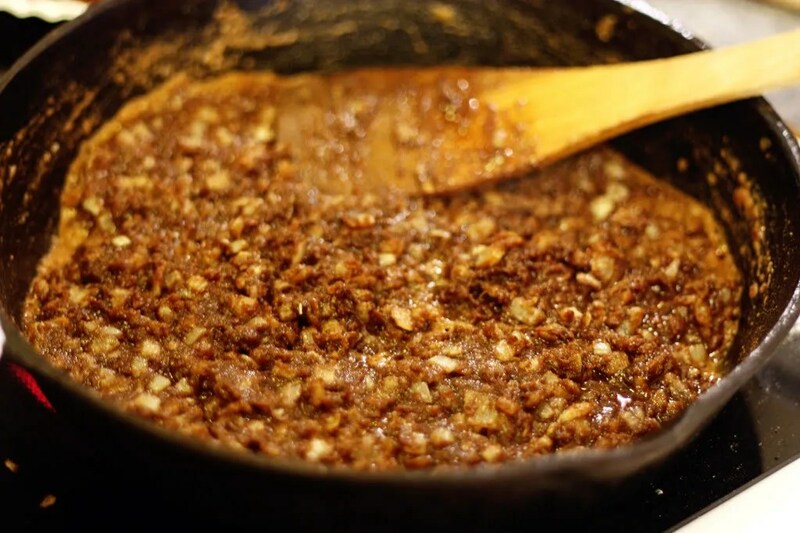 Add onions and continue cooking, stirring occasionally, until onions begin to brown and roux gets darker in color, but not black and burned. Add the celery, bell pepper, and garlic and sauté lightly, making sure not to burn the garlic. Add the Cajun seasoning, Tabasco, and cayenne pepper at this time. Stir often and scrape the pan bottom as needed. Add ½ of the chicken broth. Cook about 5 minutes, stirring occasionally. Then add the bay leaves, salt, onion powder and thyme. Add the sausage and the remaining chicken broth. Combine 1/3 cup flour with 1/3 cup water and mix until smooth, making a slurry. Stir in slurry to gumbo to thicken, stirring well. Bring to a boil, then reduce heat and simmer about 45 minutes, stirring occasionally. Next, add the shrimp and green onions and simmer about 5 minutes until shrimp are pink. Remove the bay leaves before serving. Quarter and dice the Andouille sausage. In a large Dutch oven or heavy iron skillet, lightly brown sausage in 2 tablespoons vegetable oil or bacon grease. 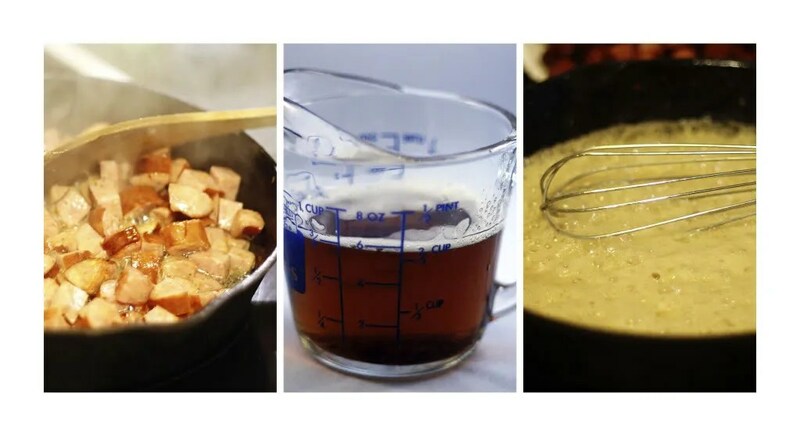 When sausage is lightly browned and rendered of fat, remove it to a plate with a slotted spoon and pour drippings in a heatproof measuring cup. Fill the cup to the ¾ cup mark with additional vegetable oil, if necessary. Return oil mixture back to the pan and heat the oil to almost smoking, over high heat. Add ¾ cup of all-purpose, flour all at once to the oil, whisking constantly. Add the sausage and the remaining chicken broth. Combine ⅓ cup flour with ⅓ cup water and mix until smooth, making a slurry. Stir in slurry to gumbo to thicken, stirring well. Bring to a boil, then reduce heat and simmer about 45 minutes, stirring occasionally. Next, add the shrimp and green onions and simmer about 5 minutes until shrimp are pink. Remove the bay leaves before serving.